The BBC’s Ripper Street is much what one would expect: It’s gory, shocking, and not for the faint of heart or the squeamish. But then, that’s police work in general, even today. We may not have open sewers running down our streets, but we are plagued with much of the same problems police had to deal with more than a century ago when the most famous of serial killers leapt onto the headlines. Taking place shortly after Jack the Ripper’s murder spree, Ripper Street is set in WhiteChapel, London, in the late 1800s, and shows a city plagued with disease, violence, and immorality. Our heroes are smart, worldly characters, who much like officers today, go where the average man would fear to tread. They are by no means perfect, but admirable in the risks that they take for their fellow citizens. 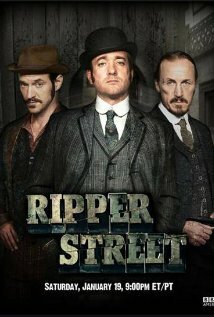 The detective team is as follows: Detective Inspector Edmund Reid (Matthew Macfadyen), Detective Sergeant Bennett Drake (Jerome Flynn), and an American who specializes in autopsies, Captain Homer Jackson (Adam Rothenberg). The refreshing part of the show is that it uses actual detection with the detectives using what they know about their surroundings and the time and neighborhood in which they live to solve crimes. It’s interesting to see how the burgeoning field of forensics plays a role in weeding out suspects, and how the Ripper murders have opened wide the possibilities of human deviancy. Why Ripper Street would make a good book series: It rings of authenticity. Many a time I have tried to read mysteries set in Victorian London only to be disappointed at the lack of detail and attention to the time period. The detectives in Ripper Street, although obviously modern, do not feel out of place in the story. Their cynicism is matched by compassion and their practicality comes from experiences with the people and world around them. They are not modern to express modern views only. Like Syfy’s Haven, the Whitechapel setting begs to be penned in written description — smells, sights, and sounds more pungent than what we encounter today. Ripper Street is a show that could only be enhanced by novels digging into the details of both the crimes and the community in which it is set.